The story of a girl preparing for the fight of her life – told by István Kovács – titled “The Sound of Concrete” (Betonzaj) won the main Award, the Golden BuSho of the 12th Budapest International Short Film Festival on Saturday evening. As a small surprise – for until this time it has not occurred that two Hungarian creations were among the best – the Silver BuSho went to Áron Ferenczik’s “Mr. Miller” (Szabó úr), that presented the strange life of a man who suffers from the loss of his senses. 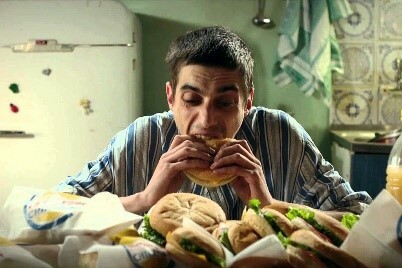 The Bronze BuSho was awarded to a Bulgarian-German co-production “Getting Fat in a Healthy Way”, directed by Kevork Aslanyan, in which a tragical accident disturbs the gravitational field of the Earth. The moderators announced in the lead-in of the Award Ceremony held in Puskin Cinema, that this year 74 shorts were selected in the competition programme; the total number of submissions was 1189. The audience could watch this last week in Puskin Cinema together with the international Jury and at the repeated screenings in Corvin Club, or at the venues in the country side and over the border. The winners were selected from among these, and they could bring the statuettes made by Solide Art. The members of the international Jury were: Nadya Bakuradze, Russian experimental film maker and video artist, Christian Inaraja Genís, artist and illustrator from Catalunya, the Hungarian jury member this year was Teréz Koncz, creative producer and director, and our permanent member of the jury, Wolfgang Leis. First, the members of the Student Jury – delegated by 4 higher education institutions (University of Theatre and Film Arts, Moholy-Nagy University of Art and Design, Eötvös Loránd Science University, Metropolitan University) – were called to the stage who thanked for the opportunity to take part in the Festival and gave short reasoning for their decisions. They deemed an Italian picture, Bellissima as best fiction, the second episode of the great Austrian come-backer, Metube 2 as best experimental short, and Beyond by Milán Kopasz as best animation. These were followed by the category prizes of the International Jury, at first those were announced who could not take part in the ceremony in person. This year saw a very strong competition in animation, and Koji Yamamura’s work, Satie’s “Parade” (Japan) triumphed. 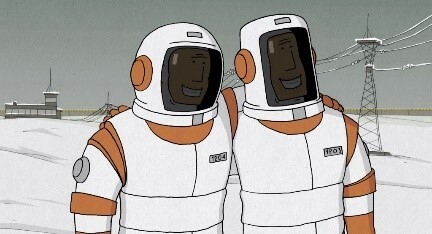 The prize for best idea/screenplay went well-deservedly to We Can't Live Without Cosmos, Konstantin Bronzit’s multiple award winner animation and also Oscar nominee. According to the Jury their easiest task was to decide about the best Comedy: this prize was given to The black bear, made in the co-production of France and Belgium. The Prize for Best Cinematography went to the animation Edmond directed by Nina Gantz, a production of the Netherlands. The unforgettable performance of Julia Pointner child actress in Patrick Vollrath’ s Alles wird gut , an Austrian production, was honoured by the award for Best Performance. The Special Prize of Búgócsiga, the venue in Sopron was given Kata Oláh (a 3-day excursion for 2 persons to Sopron combined with an audience meeting) for her work, En Passant. The audience award this year was presented to Balázs Simonyi’s Indián. After this the awardees present were asked to accept their prizes. For the second time this year the prize of the Media Council and Authority of the National Media and Telecommunication –that is a 2 x 500 thousand forints award– was given for the best Hungarian animation and fiction work. 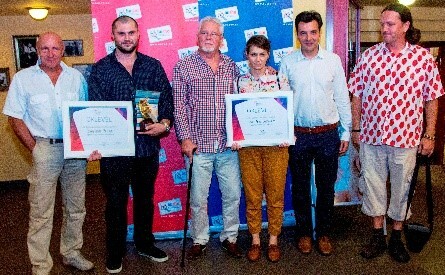 The prizes were handed over by Tamás Kollarik, Member of the Media Council, and Ferenc Varsányi, the president of the Animation Jury of the Media Council. The best Hungarian animation in 2016 at the 12th BuSho Festival was Cosmic Jacuzzi by Anikó Takács, and the best short feature was the work of István Kovács, Betonzaj. Also for the second time among the prizes that was offered by Sziget Ltd. a weekly pass for a 3-member mini crew with filming permission on the Sziget festival in 2017. Gyöngyi Fazekas took this prize for her work Képzavar (Catachresis). The Special Mention of the Jury and a special statuette was given to Ábel Visky for Romanian Sunrise. The BuSho Award 2016 for Best Experimental was given to Reinhold Bidner (being the third Austrian awarded) for Ex Terrat. He was present at the Festival all week, and –as he later told us– he would stay in Budapest for 2 months as a grantee of a study visit! Before the announcement of the winners of the main prizes, Christian Inaraja Genis was invited to the stage to share the opinion and experience of the Jury about the Festival. After thanking for the participants for their work, he briefly added that –even though they could have decided in a different way– this decision is theirs and they are proud of it. Then the winners of the main prizes were announced along with a short evaluation of the jury. Getting Fat In A Healthy Way, Kevork Aslanyan (Bulgaria-Germany). Mr. Miller, by Áron Ferenczik (Hungary). The main award of the 12th BuSho was handed over to István Kovács for The Sound of Concrete (Betonzaj). Finally, thanks were given to the sponsors for making it possible to organize the event for the 12th time: The Central European Initiative, Hungarian National Film Fund, Hungarian Academy of Arts, Balassi Institute, Pensum, Biogroup Hungary LLC, the Austrian Culture Forum, the Embassy of Israel, the Italian Culture Institute of Budapest, and Staropramen. The cooperative partner was the Budapest Festival and Tourism Center. The Award Sponsors were Solide Art – the creator of the main prizes, National Media and Infocommunications Authority, Sziget LLC and Búgócsiga from Sopron. The Media partners of the Festival are Filmvilág, Filmtekercs, Fotovideo Magazines and Radio Klub. Subsequently the awardees, the international guests, the members of the Student and the International Jury and the staff members were invited up to the stage for a group picture. After the closing ceremony, the audience could watch some of the winners and as the last stage of the festival a concert given by “Zsuzsi mosolyog” was presented in Fészek Klub. Let’s meet at the 12th anniversary BuSho International Short Film Festival in 2017!